Montreux 4th July 2018 – Plaque Unveiling Ceremony at the Former Grand Hotel. With the proceedings due to kick off at 11 am, we hopped off the train at Territet with about 25 minutes to go and strolled across the street to the building itself. We struggled to recognise it at first due to it being covered in scaffolding; one reason for having the plaque located round at the unobstructed rear entrance – actually this made sense as this was where the mobile studio was parked – and it meant that we could hear the speeches (and not get run over!) shielded from the relatively busy road to the front. As we arrived tables of food and drinks were being set up opposite the rear entrance, and a copy of Machine Head stood on a podium to the side, with a picture of the mobile studio parked there some 40-odd years previously on the wall at the other side. The good folk of Montreux made us feel very welcome, and we chatted with just the occasional craning of the neck to peer down the road to see if there was any sign of any Purple people arriving. Roger had promised to attend together with “whoever else he could drag along”. As 11 am approached, a sleek looking people carrier was sighted at the bottom of the slope; it drove up to the car park barrier and the doors opened – Roger was first out, followed by Ian Gillan and Paicey. They ambled up the road in the style of a royal walkabout, stopping to shake hands and chat with people in the assembled throng (of probably around 100 people). Once at the top they went inside the foyer (which was open) and we followed them in – it was kind of awe-inspiring to be in such an historically significant building. They were happy to chat, pose for photos and sign anything thrust in front of them, and after a little while we ventured back out into the sunshine for the unveiling. There were speeches, including one from Paicey, who said that this was the first time he’d been back to the building since he finished work on the Machine Head album. He actually explained in terms I could understand the necessity of all that climbing out of windows/across balconies business too. The plaque is a nice thing – not the sort of blue metal affair I was imagining, but rather a laser-etched glass creation, with a (surprisingly effective) button to back-illuminate it on command. As well as including a contemporary picture of the band from the time of recording the album, the plaque details the significance of the album and building too. 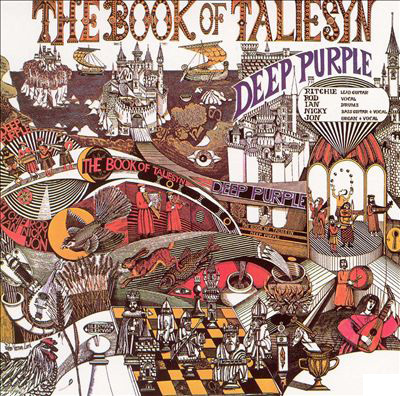 I spoke to its Italian creator, and he said that he wanted to make something special for a band as important as Deep Purple. Montreux itself is quite an amazing place, and it really comes alive for the annual music festival. Later in the day Roger did a sort of Q&A about the significance of it all, the fire and the recording of the album, and we spotted him again later just walking down the street (probably returning from the soundcheck for that night’s gig). Paicey summed up the sort of intertwined nature of the band and place in his closing remarks about the recording of Machine Head here: “Looking back on our career, probably one of the the most important 3 weeks of our lives”. –Tim Summers (thanks to Keith Sharp and Ian Edwards for the photographs). Below, Keith’s picture of the plaque in situ. The text is a bit clunky but you should have seen it before we re-wrote it! It was supposed to have the album title and name off the sleeve too, not sure where those went… But a very swish item which does the band proud. Couple of photographs from the July 4th Montreux event, kindly sent by Claude’s friend Jean Paul. Jean worked with Claude during the Machine Head sessions, and is on the right in the photo with Roger. The photo below is from outside the former hotel foyer, and shows Gillan and Glover busy signing sleeves. Yvon Welt on the right of this photo has been instrumental in helping get the plaque put up, which you can see on the wall behind Ian. From today anyone visiting can at least be sure they are at the right building and the ceremony got lots of coverage in the Swiss press and further afield. More information to follow! Back in Blighty, and time for the final report on the Montreux trip. As we mentioned, one of the reasons for the visit was for myself and Stephen to try and nail locations associated with the Machine Head sessions. We were fortunate in this to have the help of Jean Paul, who worked with Claude Nobs for over a decade, and was a good friend ever since they met at scouts as teenagers. JP, as everyone knows him, performed any number of duties, and shared an office with Claude from the late 60s and was there during Deep Purple’s stay in late 1971. As such he helped book hotels, and was instrumental in the hunt for alternate recording sites after the Casino fire (having been one of the crew who helped shove the Stones Mobile to relative safety earlier). And if you know the Didi Zill shot of Roger getting his teeth into a tasty looking burger during the recording, then JP (who was a Michelin starred chef) cooked those as well! We met with any number of interesting people and numerous current residents, even the owner of the building, and got lots of detail about their stay in in 1971. It is clear that there is a lot of goodwill from all concerned to make sure the building is suitably signed in future, as well as making some kind of trail for the sites associated with the album sessions (and a map for visitors to download). After I had given everyone a quick history lesson (they sprang this on me just 48 hours in advance), Roger Glover told his side of the story to the assembled guests, before the chap who handles the area’s residents association then explained how he saw this going ahead. It is tricky because they do not want to disturb the privacy of the residents, but they would like to have the history better known. There is a plan for a large plaque or interpretive panel of some sort, but getting permission is complex as it is a listed building. This visit had to be kept private, but if all goes well it might be possible to arrange future official pre-booked visits open to all. Originally both Ian Gillan and Ian Paice had wanted to come as well. IP as you might imagine is being very carefully looked after, his wife Jackie travelling with him, and on the day they decided he needed the extra rest after the show the night before. Don Airey did come along though (and was as much taken by JP’s beautiful vintage MG outside the foyer as anything else!). After the formalities, everyone had a chance to explore the corridor and the Doctor who lives in the far end (which is partitioned off now and forms part of his study) kindly opened his flat so Roger and everyone could work out where the band were all set up. After an hour or so, when people had begun to leave, we were able to tour the rest of the building (which is listed) and then spend a couple of hours in the company of Yvon, one of the apartment residents who had helped organise the visit, and interviewing JP informally to get his take on the events and answers to many of our questions. I’ve done a few rock interviews in my time, but sat on benches under the trees on the Lake Geneva shoreline (!) beats them all. We then spent some time trying to take photographs to match up with those from the time. The above photograph shows the corridor as it is now for example. It was always hard to grasp the size of the blaze, but the photo below gives us an idea; the red awning on the left is the current Casino. When it went up, the flames at one stage reached to the top of the apartment block on the right, and it was feared it too might catch fire. One reason for all this was to push me on to wrap up work on the upcoming Machine Head book, and if you want to keep in touch on this then it would be wise to scoot over to the publisher’s website and sign up for the newsletter if you have not already done so. They are hoping to get the book out before Christmas. In the meantime a big thanks to Stephen Clare who made some of the initial contacts for us; to everyone in Montreux who helped get this together, and Roger Glover for agreeing to take part. It was nice also to meet up with Mike Wiklund again (for the first time since Jon’s memorable farewell show in Ipswich), he was in Montreux for his 99th Deep Purple concert!, and photographer Sue Burton, who like us had decided just to make the trip as it was something she felt she ought to try and do at least once as a Deep Purple fan. Lastly, I like quirks of fate. While the Casino burnt out and was demolished, apparently some of the fire crew did pull fixtures and fittings out. Some of the chairs survived. And are still being used today! I was quite sceptical, fearing we were being wound up by our hosts, but underneath it still has the Casino address property label… though quite why anyone would want to risk their lives for something like this is beyond me. Work on the Machine Head book is proceeding, with Stephen corresponding with Jean Paul, who was at the Casino event the night the place went up. And he clearly wasn’t afraid to get stuck in either. 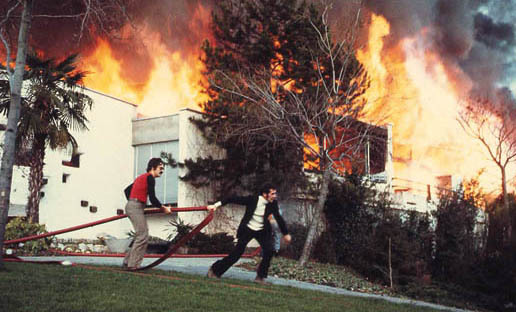 This amazing photo we’ve seen before on this site, but we now know that is Jean himself on the right with Claude Nobs desperately trying to get one of the hoses round to tackle part of the blaze. Jean was one of Claude’s best friends, and has been able to help us fill in some of his early career and explain how the whole Montreux Super Pop and Jazz festival events came about. During work on the book we’ve also found pictures of the blaze inside the casino roof which kicked the whole saga off (though you do wonder who would stop inside the hall to take such a picture…! ), and a bewildered security guy on the stage with a megaphone trying to get people to take it seriously and leave. The more I see of the event the more I’m amazed everyone got out safely. Claude by the way reckoned the band only finished Smoke off for him as a thank-you tape given at a party before they left, and hadn’t intended it for the album…. We’re still trying to get the chronology sorted as photographer Didi Zill now thinks he snapped Ian writing the lyrics only a couple of days after the fire. As ever any info on the scene or events welcome! Record Store Day UK is but a few weeks away, and sleeping bags will soon start to appear outside Barry’s Record Collector shop in Sheffield as per every year. There is a quartet of Deep Purple items on offer this year in the UK (other territories often do their own thing). Thanks also to Tim Summers. Deep Purple – Out Of Hand – This is a 10″ vinyl release off the current album, with the album track backed up by Après Vous (Instrumental), and on the b-side Lazy (Live At Wacken Open Air 2013) and Hell To Pay (Instrumental). Also from recent times is a vinyl edition of Live With Orchestra: Montreux 2011 (3LP), which has been out on DVD and CD already. From olden times comes Black Night / Speed King 7″ on blue opaque vinyl and The Book of Taliesyn in glorious mono, on white vinyl. This follows up last year’s Record Day issue of Shades. Given our hassles getting stock in the past, will not advertise these up front, but WILL try to get unsold copies after the day for the new DTB collectors store. We have managed this in previous years, and always sell at regular retail price. Soup recipes will follow. Search for previous Record Store Day articles relating to the band on this site using the box on the right. Meanwhile here is an amusing look at the Record Day phenomena from one of the record blogs I follow which some may find all too familiar!